Every time I cook Italian style rice pasta the whole pot becomes "starchy" and some of the pasta always gets stuck to the pot. Is there a way to prevent this from happening? So, my first piece of advice is to choose the pasta carefully, if you don't like a brand try another brand next time. For what it is worth, ATK disliked all of the corn-based pastas. 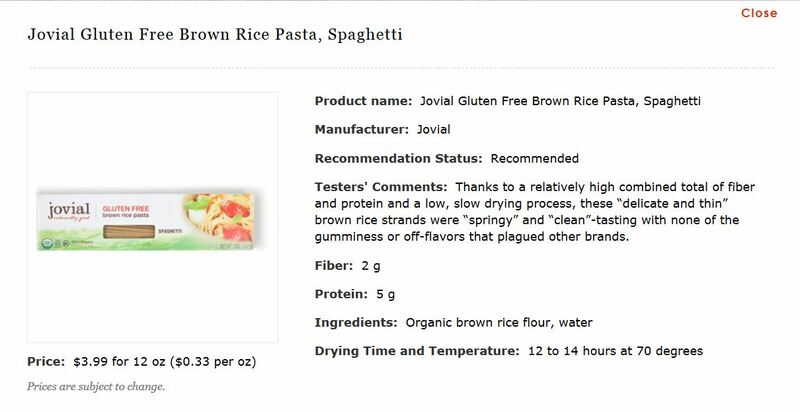 I looked at a few articles about cooking gluten-free pasta, a few points were repeated in every article. First, start with a big pot of generously salted water. Bring the water to a hard boil before you add the pasta, stir the pasta frequently as it boils, and absolutely do not overcook. You should taste the pasta frequently; it will turn to mush on a dime. More articles say to not rinse the pasta than call for rinsing the pasta assuming that it is to be served hot. The same goes for regular pasta, you shouldn't rinse pasta except for use cold as in for salads. While I don't have a citation that specifies finishing gluten-free pasta in the sauce, it absolutely makes sense to me to put the not-quite-done pasta in the sauce to finish cooking. Again, taste often, gluten-free pasta overcooks very easily. Reserve some of the cooking water, just like as is recommended for regular pasta, in case you need to loosen the sauce. Don't be tempted to add oil to the water. It doesn't work to keep regular pasta from sticking, nor does it work for gluten-free pasta.